These super soft sprinkle pudding cookies will be a staple in your baking arsenal from this moment on. Trust me. 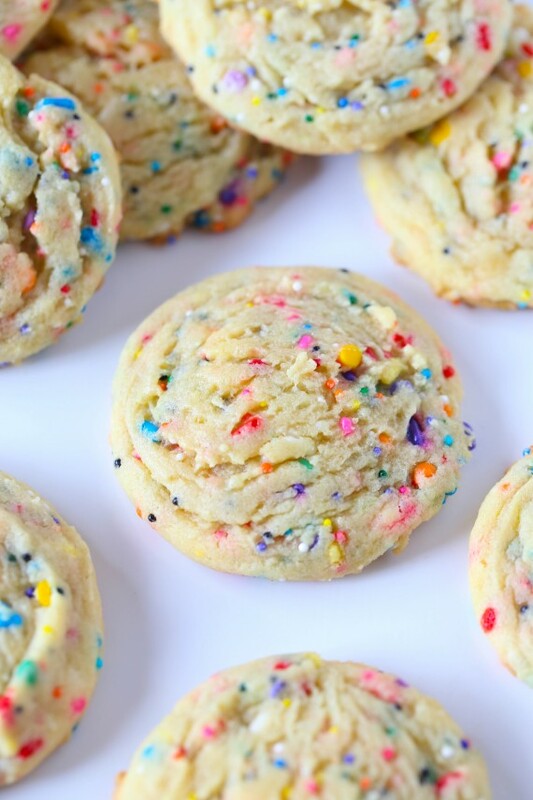 They’re ridiculously easy, loaded with vanilla flavor, non-messy and did I mention sprinkles are involved? Yep. 1 Preheat oven to 350°F. Line a baking sheet with parchment paper and set aside. 2 In the bowl of your stand mixer fitted with the paddle attachment beat the butter and sugar on medium speed for 2 minutes. Add in the egg, vanilla, baking soda and salt. Mix until combined, scraping the sides of the bowl as necessary. 3 Next mix in the pudding mix for 30 seconds. 4 Turn the mixer to low and add in the flour, mixing until just combined. 5 Finally add in the sprinkles and mix until incorporated evenly. 6 Using a medium (2 tablespoon) sized cookie scoop drop dough onto the prepared baking sheet 2 inches apart. 7 Bake for 8-10 minutes until the cookies are almost set. Don't over-bake if you want super soft soft cookies. Allow the cookies to cool on the baking sheet for 3 minutes before transferring to a wire rack to cool completely.